Donations & Bequests | S.A. Police Legacy Inc. If you’d like to donate to our cause, then there are many ways of doing this. 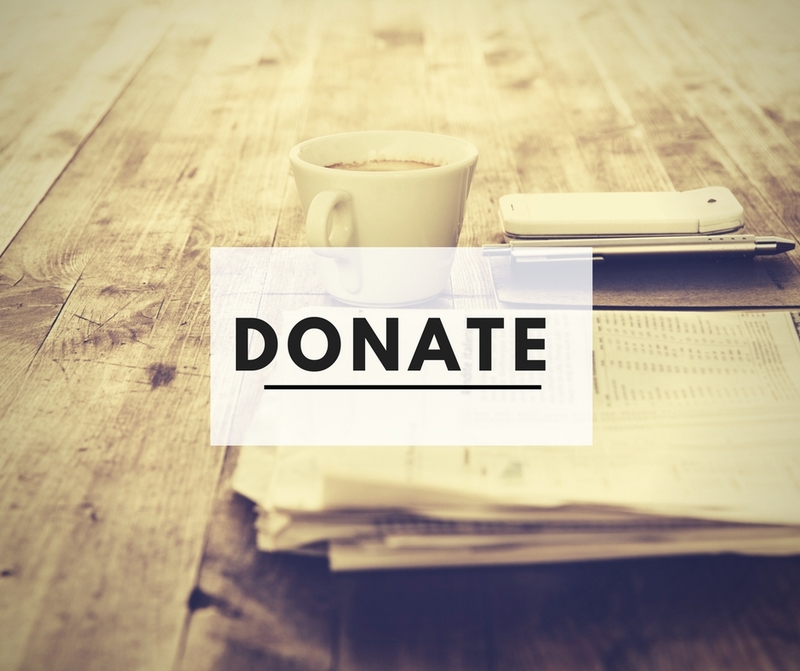 For automatic, online donations you can click the donate button here via our trusted donations portal. Cheques payable to SA Police Legacy Inc.
SA Police Legacy gratefully accept donations in memory of family & friends. Donation envelopes are available in our office or through your Funeral Director. SA Police Legacy does not actively solicit bequests as we appreciate that family and loved ones should always come first and maintain that it is an important step to talk to family and loved ones about your will. However, if you choose to include a gift in your will to SA Police Legacy Inc., it doesn’t need to be complicated. It would be most gratefully received and used to support services and benefits provided to our Police families. Your solicitor/attorney who is preparing your will for you can discuss options available. ABN: 57 768 418 030. You may wish to use the below example wording when preparing your will. “I wish to give, free of all estate duties and charges [the residue of my estate both real and personal OR the sum of $…. (or property or shares)] to SA Police Legacy Incorporated ABN: 57 768 418 030, to be applied for their general charitable purposes and in respect of such bequest, I declare as follows: A general charitable intent shall apply. The receipt of the Chief Executive Officer, Treasurer or other proper office shall be sufficient discharge to my executors and trustees. My executors and trustees shall not be obliged to see nor enquire into the application of money or assets, the subject of such legacy. A charitable organisation that provides the much needed funds that allow us to continue to support the surviving Police Legatees and Police Wards of South Australia Police Officers. 2nt stay at Big4 Renmark in a 2brm Riverfront Villa (sleeps up to 2A+4C), $500 prepaid Visa Card thanks to www.policecu.com.au, a Series 3 Apple Watch thanks to www.policehealth.com.au AND a Char Broil Portable Grill 2Go x200 from Harvey Norman. Choice of Adelaide Crows or Port Power Signed Football plus a Family ticket (2A+2C) for an Adelaide Oval Stadium tour. Tickets are $5ea, with 2000 on sale. 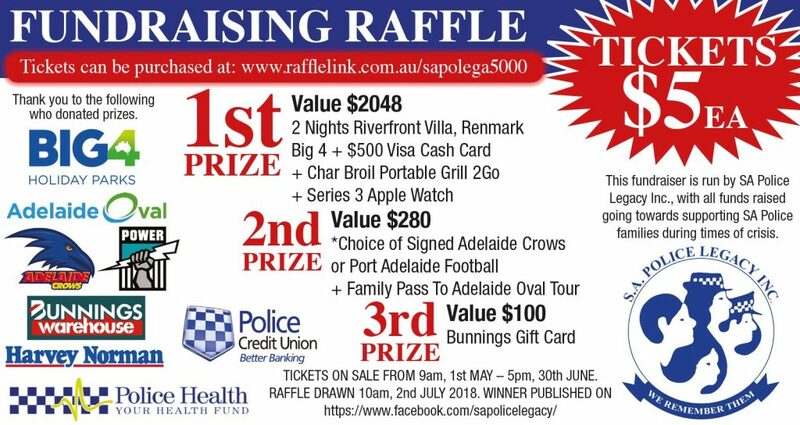 When you donate to SA Police Legacy Inc. you are helping us run services and pay grants to SA Police families who have either lost a loved on or those who face serious health issues. SA Police Legacy together with the funds raised. Please note that tax deductible receipts cannot be issued if a person receives goods, services or ‘a chance to win’ in return for the money given (i.e. they purchase an auction item or raffle tickets) or if there are directions given as to how the funds may be used, to comply with Australian Taxation Office law. For some collection activities licenses may be required by local or state government authorities. Please ensure that you comply with all requirements before commencing. If the activity involves working with children or other vulnerable people a National Police Clearance will be required for each person involved. If the activity involves children with special needs, a DCSI screening is required for each person involved. Your event will not be covered by SA Police Legacy Inc. insurance so it is important to ask your own insurer about cover for any event you are planning. You will have a health and safety responsibility to participants so please ensure you consider need for first aid, hygiene laws and best practice, and have a risk assessment to check for potential hazards and measures to minimise risk of injury. Share your testimonial below, we would love to read it.